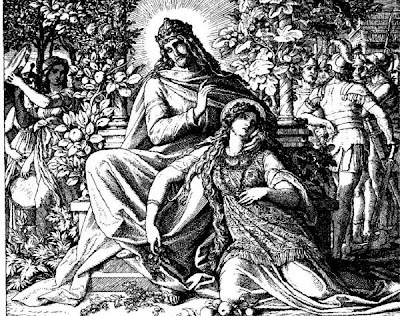 King David died and Solomon, his son by Bath-sheba, inherited the kingdom. Solomon was the third and last king to rule over both Israel and Judah. He walked in the in the ways of the Lord and built a temple to the Lord. Not long after he became king he made an "affinity" with the King of Egypt and took Pharaoh's daughter as his first wife. Solomon's kingdom was overthrown by Jeroboam (1 Kings 12:19-25). Jeroboam was successful because he was supported by the people who were tried of all the taxes and labor forced upon them because of Solomon's building projects, which included the palace and upkeep for Pharaoh's daughter (1 Kings 12:3). 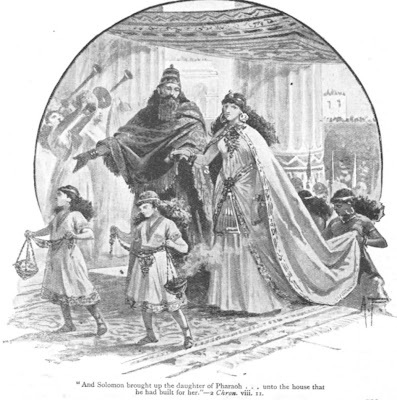 Scholars don't agree as to her identity, but she is speculated to be the daughter of Pharaoh Shoshenq 1 and that her name was Nicaule or Tashere. 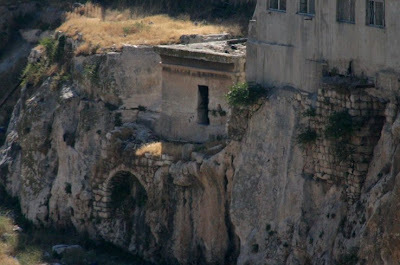 This tomb in Jerusalem is claimed to be hers. Archeologists say that the reason it has a flat roof is because it once supported a pyramid on top of it as a fancy headstone. God has given commandments on marriage. The greatest joy and peace possible, in this life and in eternity, comes when these commandments are followed. What type of influence do you have on the men (or women) in your life? Are you using that influence to bring them closer to God? Why do you think the Lord command the Israelites not to marry foreign wives? What harm could it do? Do you think that Solomon knew he was sinning by taking a foreign wife? How do you think he justified it? I agree that husbands and wives have the power to influence each other, especially when it comes to devotion towards God and His principles. As an example, just the other day I heard about a study which suggested that couples share ideologies--and in this season of political voting, also tend to vote the same way (thereby not canceling out each other's vote). The political realm is a tiny example of the many ways husbands and wives compliment each other. Personally, I know that marriage has radically changed the way I think about things. Before getting married I had seriously thought of commissioning in the Army-despite an internal hesitancy to do so. But after marriage, numerous discussions, and the hand of God closing doors, I quickly came to realize that the Army was not where I was meant to serve in life. Despite feeling hesitant about the decision before, my wife seriously helped me make a firm commitment not to join the Army and to see that greater possibilities that exist to promote peace (I used to think that if I supported the US Army then I was supporting peace efforts). After learning about Solomon's marriage to Pharaoh's daughter, I can understand how their relationship would have caused them to become distracted and pay less and less heed to God's commands. Hey cute Heather. So I've been reading this blog and thinking about the fun gospel and scriptorial discussions we used to have. And I decided that this is a way to continue that again. And that I needed to post my thoughts. I want to address this question: Why do you think the Lord command the Israelites not to marry foreign wives? What harm could it do? I think it's important to remember that there are different types of commandments from the Lord. There are the commandments that are given to us to keep us from doing something inherently wrong-murder, for example-- And then there are the commandments that are given to us because they are good for us--what to eat that's good for our body in the word of wisdom. The distinction is not cut and dry and they often overlap. Of course, disobeying any commandment from the Lord is inherently wrong. That being said, I think that the commandment to Israelites to marry other Israelites falls into this second category. It is not inherently wrong to marry someone outside the tribe. But the Lord needed the Israelites to remain a strong and united people in a time of great difficulty. The Israelites were conquered and thrust from their homes over and over again. It's amazing that they managed to stay as united as they did in the midst of all that. I think this commandment helped them achieve that. Also, we are commanded to marry in the temple for time and all eternity. That's a little hard to do when you marry those of other faiths. K, sorry it's so long. One last important thought: Disobeying a commandment from God is wrong, regardless of the reason for the giving of that commandment. Oh, Also... God's ways are not our ways. We can't presume to know why a particular commandment is given. We may guess at certain plausible reasons, and even if they happen to be right they are only part of the story. The Lord knows all. And His reasons are not known to us. The Lord requires that we obey his commandments whether we understand them at the time or not. I also believe that the Lord will bless us with a testimony of a certain commandment if we seek it. This can help us strengthen or resolve to follow it and understand the ways of the Lord a little better. some say that the Queen of Sheba was Pharoah's daughter. Is this possible, and if so, what about Matthew 12:42? Hello, just a stranger popping in... I love this blog and the way you lay it out and this topic is really interesting! I wanted to comment on the question of Anonymous because in 2 Chronicles 8:11 it says Solomon brought pharoah's daughter up from the City of David to the palace he had built for her and he quoted her as being his wife in the same verse. 2 Chronicles seems to all be written out chronologically and the very next chapter has the Queen of Sheba visiting Solomon because she has heard of his fame. It says she saw his wisdom as well as the palace he had built (which was the palace for his wife, pharaoh's daughter...) So, the Queen of Sheba couldn't be his wife. The Greatest champion of Women is Jesus....I am a scripture loving, baby snuggling, chicken raising, modern dancing, garden growing, home birthing, doula working, fast swimming, muffin loving, Mormon wife, mother, sister, and daughter. ...but the Jesus of the Holy Bible is not the Jesus of the Mormon doctrine, if they believe that Jesus was created by God. Jesus was not created, but is the 'I AM' and always 'IS'... That is where our salvation resides. This is a very nice blog, but I have concerns about Mormonism. Do you believe Jesus and God are One? That is what the Bible teaches and why God (the Christ) could die to forgive us of all our sins. This is the foundation of Christianity and where Mormonism fails.